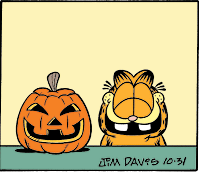 I’m writing this post because Garfield wanted to say happy Halloween to everybody. ’tis a good day, I have to say. Don’t die, it’s bad for you. Oh, and so is eating a ton of candy. One other thing… If you donate blood on Halloween, they give you a cool pin that says ‘Holiday Hero’ on it, with a witch and all. It’s pretty sweet. Anyway, that’s the end of my billions of random paragraphs. Have a jolly good day, everybody. Russ, thanks for posting your blog on facebook. I have enjoyed reading your thoughts! No problem. It’s good fun to write on a blog. And yes, I suppose that I did dress up. I carried a sword and wore a shirt that weighs 20 pounds. It was pretty cool.